The first factory in the United States was begun after George Washington became President. In 1790, Samuel Slater, a cotton spinner’s apprentice who left England the year before with the secrets of textile machinery, built a factory from memory to produce spindles of yarn. The factory had 72 spindles, powered by by nine children pushing foot treadles, soon replaced by water power. Three years later, John and Aethur Shofield, who also came from England, built the first factory to manufacture woolens in Massachusetts. Shortly after the War of 1812, a new form of business enterprise became prominent — the corporation. In a corporation, individuals are financially responsible for business debts only to the extent of their investment, rather than extending to their full net worth, which included his house and property. First used by bankers and builders, the corporation concept spread to manufacturing. In 1813, Frances Cabot Lowell, Nathan Appleton and Patrick Johnson formed the Boston Manufacturing Company to build America’s first integrated textile factory, that performed every operation necessary to transform cotton lint into finished cloth. Lowell and his associates hoped to avoid the worst evils of British industry. They built their production facilities at Massachusetts. To work in the textile mills, Lowell hired young, unmarried women from New England farms. The “Mill Girls” were chaperoned by matrons and were held to a strict curfew and moral code. During the 1840s, the population of the country as a whole increased by 36%. The population of towns and cities of 8,000 or more increased by 90%. The impact of the creation of all these factories and corporations enticed people from rural areas to the cities where factories were located. From 1880, the Carolinas mills employed children in preference to adults. As well as the usual report of hands and fingers getting severed by the machinery, and insufferable heat- the dust inhaled caused a fatal condition known as brown lung. Laws were rarely enforced, and the presence of small children in the factory was explained away to the inspectors saying they were visiting the mill to bring meals to their parents (meal totters), or helping but not on the payroll (helpers). Wages were good for the workers who could earn $2 a day in the mill against $0.75 on a farm. 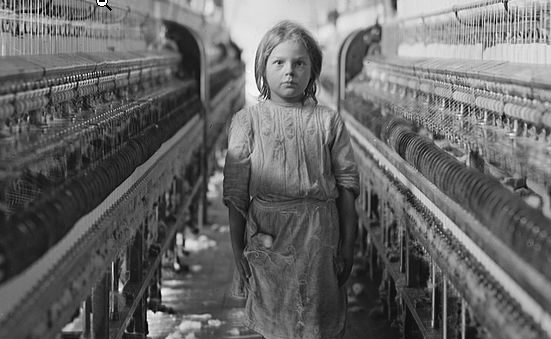 In the segregated south, ‘Blacks’ were not allowed to work inside a mill; had they been the need for child labour would have been eliminated. Child labour finally stopped, but sadly is was not only because of new laws. The type of machinery was adapted and changed, which required greater height and skill. Despite a beginning rife with child labour, racism and extremely hard working conditions, the corporation evolved and grew into what it is now: a central force in America’s economic growth. Dependable, long-lasting, custom-made air-cooled heat exchangers by Smithco Engineering. Information and some content was provided by The Independence Hall Association and is licensed under a Creative Commons Attribution 4.0 International License.